This mantra was taught at the first kundalini yoga class I attended. 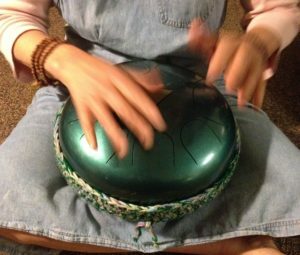 The class itself was kind of a miracle – there was live music and towards the end, the room was filled with chanting, and I felt so happy. I hadn’t felt that happy in a long time. Or maybe ever in quite that way. I began going to kundalini classes, four and five times a week, and I invariably felt that happiness. Driving to work, instead of turning on the radio, I began to sing mantras in the car. That, too, made me feel happier, and it put me in a much more balanced frame of mind once I began seeing my clients. Then I began to make up my own tunes. This version of the miracle mantra was one of the first. Guru Guru Wahe Guru – the wisdom of dark (gu) and the light (ru) coming into balance, the incandescent experience (wa) of the NOW (he). Guru Ram Das Guru – the wisdom (guru) of sun (Ram) and earth (das) in their celestial dance, the teacher Guru Ram Das, the third Sikh Guru. There was a small framed painting of Guru Ram Das on the bench where the yoga teacher sat; he had a very long beard and kind eyes. I thought of that picture when I began this recording. Laying it down, track by track, the overlaying lines penetrating my brain through the headphones, hour after hour . . . my voice was getting tired. I thought of the little picture and asked Guru Ram Das to help me get all the audio I needed for the recording. It was the strangest experience – maybe it was the exhaustion, the heightened feeling from singing the same mantra for going on five hours – but I suddenly felt expanded, as if I were standing in a spotlight, and when I moved my arms they projected out two or three times farther than my physical arms. When I got up, the large almost awkward, aura got up too, and moved with me as my body moved. I did get all the material I needed and when I left the studio, I carried the huge light with me. The feeling of that light body lasted for days. The story goes that, when you need help to do something impossible, chant this mantra and you will get the help you need. So far, every time I have chanted it in distress, some kind of help has come – even just in a feeling of peace, in the feeling that whatever it is will be taken care of, somehow. 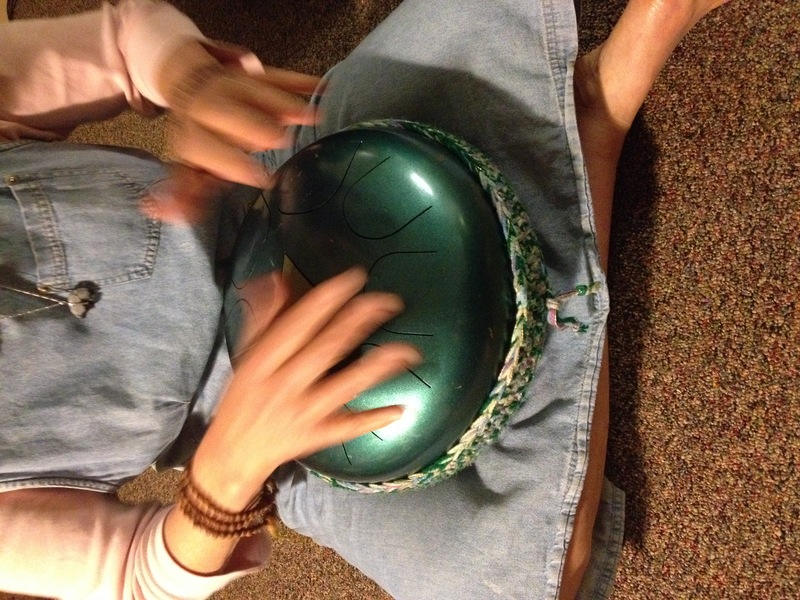 The instrument used to accompany the singing on the recording is a steel-tongued Bhakti Drum, handmade by Vision Hawk Music. it is tuned to 528 Hertz, the frequency of Joy.